The 5th World Construction Symposium 2016 on “Greening Environment, Eco-Innovations & Entrepreneurship” was held from 29th to 31st July 2016 at Galadari Hotel, Colombo, Sri Lanka. The symposium was jointly organised by the Building Economics Management and Research Unit (BEMRU) of the Department of Building Economics, University of Moratuwa and the Ceylon Institute of Builders (CIOB). The symposium was sponsored by International Council for Research and Innovation in Building and Construction (CIB). Liverpool John Moores University, United Kingdom, Centre for Innovation in Construction and Infrastructure Development (CICID), The University of Hong Kong, Indian Institute of Technology Madras (IIT Madras), Auckland University of Technology, New Zealand, Northumbria University, United Kingdom, Robert Gordon University, United Kingdom and Colombo School of Construction Technology, Sri Lanka were the Associate Partners of the Symposium. Built Environment Project and Asset Management (BEPAM), a journal published by Emerald Group Publishing, arranged for two awards, namely; the BEPAM Best Paper award and BEPAM Highly Commended Paper award. 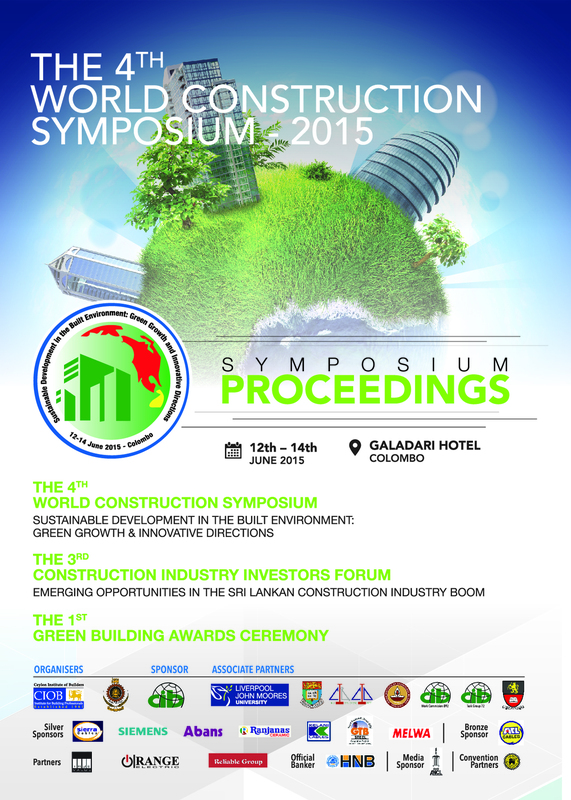 The 4th World Construction Symposium 2015 on “Sustainable Development in the Built Environment: Green Growth and Innovative Directions” was held from 12th to 14th June 2015 at Galadari Hotel, Colombo, Sri Lanka. The symposium was jointly organised by the Building Economics Management and Research Unit (BEMRU) of the Department of Building Economics, University of Moratuwa and the Ceylon Institute of Builders (CIOB). The symposium was sponsored by International Council for Research and Innovation in Building and Construction (CIB). Liverpool John Moores University, United Kingdom; Centre for Innovation in Construction and Infrastructure Development (CICID), The University of Hong Kong; Indian Institute of Technology Madras (IIT Madras); CIB-TG 72 (Public Private Partnership); CIB- W092 (Procurement Systems) and Colombo School of Construction Technology were the Associate Partners of the Symposium. Built Environment Project and Asset Management (BEPAM), a journal published by Emerald Group Publishing, arranged for two awards, namely; the BEPAM Best Paper award and BEPAM Highly Commended Paper award. 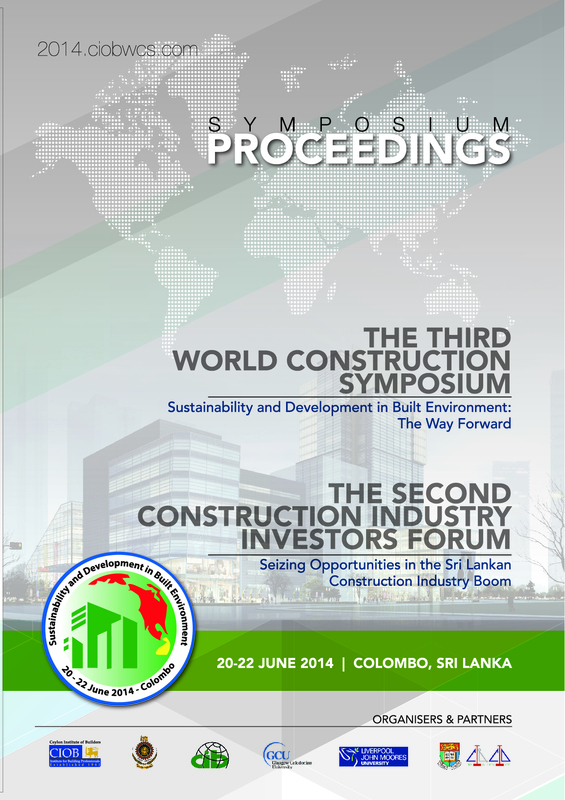 The Ceylon Institute of Builders (CIOB) and Building Economics and Management Research Unit (BEMRU), Department of Building Economics, University of Moratuwa, Sri Lanka are jointly organizing the Third World Construction Symposium on 20 – 22 June 2014. The symposium was sponsored by International Council for Research and Innovation in Building and Construction (CIB).Glasgow Caledonian University, Liverpool John Moores University, United Kingdom and Centre for Infrastructure & Construction Industry Development, The University of Hong Kong are the Associate Partners of the Symposium. 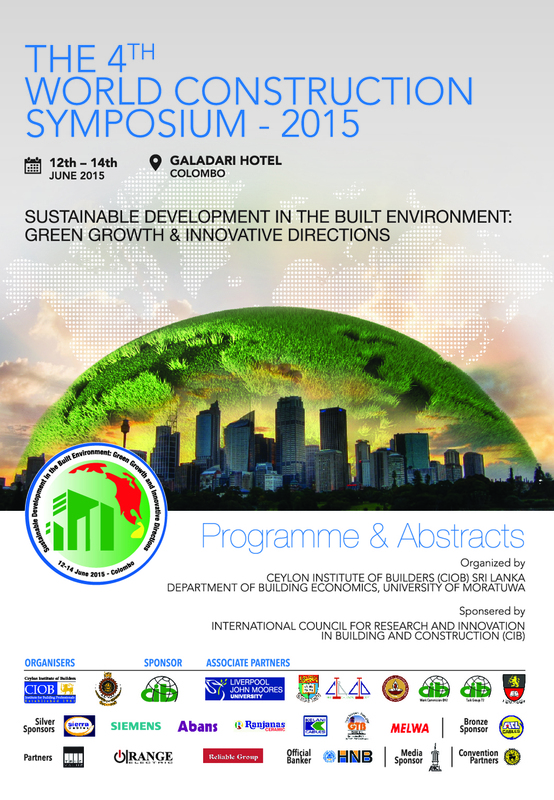 The main theme of the symposium was “Sustainability and development in built environment: the way forward”. Built Environment Project and Asset Management (BEPAM), a journal published by Emerald Group Publishing, arranged for two awards, namely; the BEPAM Best Paper award and BEPAM Highly Commended Paper award. 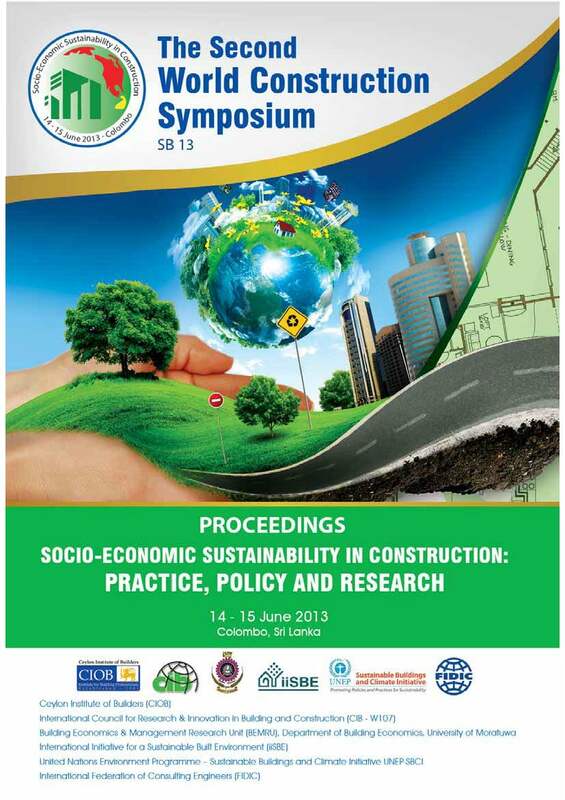 The Ceylon Institute of Builders, International Council for Research and Innovation in Building and Construction (CIB-SB13) and Building Economics and Management Research Unit, University of Moratuwa jointly organised The Second World Construction Symposium, from 14 – 15 June 2013 at Cinnamon Lakeside Hotel, Colombo, Sri Lanka. 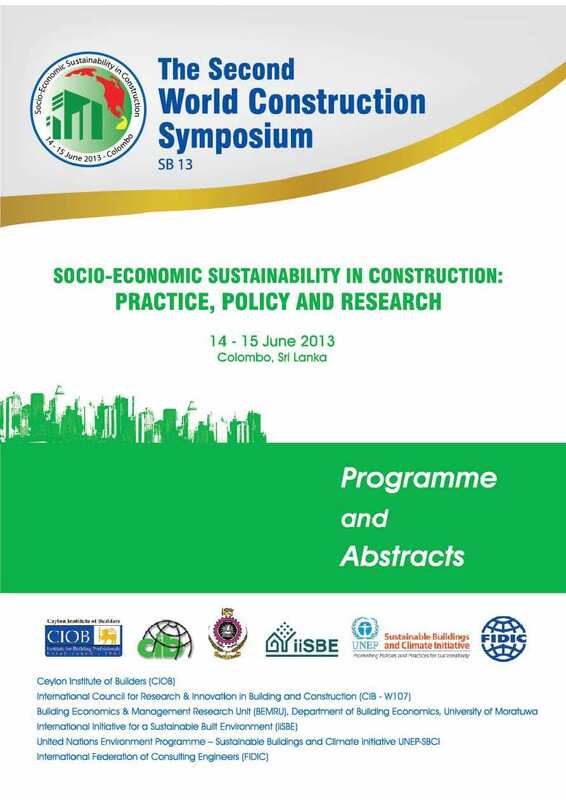 The theme of the symposium was “Socio Economic Sustainability in Construction”. 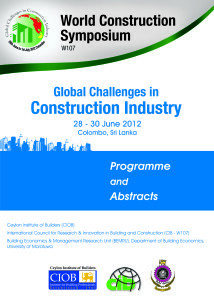 The Ceylon Institute of Builders, International Council for Research and Innovation in Building and Construction (CIB-W107) and Building Economics and Management Research Unit, University of Moratuwa jointly organised The First World Construction Symposium, from 28 – 30 June 2012 at Colombo, Sri Lanka. 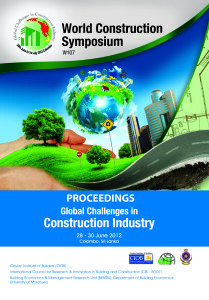 The theme of the symposium was “Global Challenges in Construction Industry”.